Lewis County Quarterback Isaac Kelly gets past a Boyd County player in Friday’s game. The Boyd County Lions defeated the Lions of Lewis County 70-21 at the Lewis County High School Field. 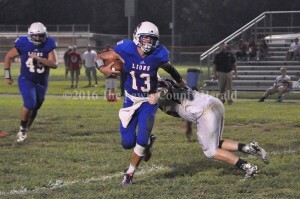 The LCHS Lions will next be in action at Nicholas County on September 9.